Style up an HTML table using CSS with this easy breezy table generator. Select from preset color settings or select your own theme with the controls. Once finished the HTML and CSS will be generated. A Simple pattern generator, that takes the hassle out of opening up Photoshop, creating an image then uploading/attaching to your site. Patternify basically takes away the need to have an image file, you create your custom pattern which then generates the code to place on your site. CSS3 generator gives you the simple and easy way to create rounded corner, box shadow, background gradients and opacity to implement onto your web design projects. Visually create with the sliders all in one place, once you’re satisfied with what you’ve got, generate the code and place onto your stylesheet. Another CSS3 generator, this one gives you a bit more flexibility…aside from the rounded corner, box shadow…etc. You also get text shadow, multiple columns, transitions, @ FontFace, selectors, rgba, box sizing, outline and transform. CSS 3.0 Maker is…yes, another CSS3 generator, again giving you much more flexibility creating lovely styles. I remember not too long ago, creating buttons on a website required creating images, and sometimes multiple instances of images, which was fine and dandy, except the more image files you’ve got on your site the slower it becomes to load the page. That’s when the button generator comes in handy. Create beautiful buttons without the need of any images….only the goodness of css code. If you use Photoshop, you’ll appreciate this. It generates a Photoshop-like editor all in CSS…no need for images. Here’s another great CSS3 gradient generator. This CSS Sandbox pretty much generates everything mentioned above, great UI to work with and my favorite part, generates radial gradients, an addition to CSS3. I personally love this one! Working with Illustrator for over a decade, i was quite impressed to find a CSS text to path generator. Now you don’t need to create rounded or warped text effects using images. Just play around with the curves as you would in Illustrator paths ..and generate it to CSS! This one pretty much speaks for itself. Focuses on creating crazy cool 3D text shadow goodness. Iconize textlinks provides a CSS file that pretty much generates a little icon next to a link, which identifies what “type” of link is attached on your website. This one is pretty neat…if you work with a lot of data, it will convert an Excel sheet into HTML, JSON, XML and other web-friendly formats. The Crunchie Corner Lab is a simple tool allowing you to see how a variety of different borders, colors, shadows and radius values affect the display of your fancy CSS3 rounded corners. LayerStyles is another Photoshop-like tool that generates custom CSS, in the same way you would add styles to a Photoshop layer. This one comes in quite handy when you’re creating a website. You’ve got 12 different template layout styles to choose from, all provide a preview and the basic CSS you can work and expand from. ProCSSor in an advanced tool that prettifies the appearance of your CSS the way you want. An excellent way to turn you CSS into a visually appealing structure and no effort on your part, just copy, paste, attach…and procss away! Boxtuffs is a fabulous site proving free PSD, HTML5 and CSS3 goodness! 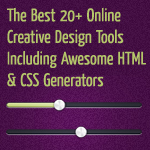 QuirkTools provides online tools for creative people. When designing a website, one of the best ways to save time and space is by creating Sprite images. If you don’t know what CSS Sprites are…here’s a fabulous article “CSS Sprites: What They Are, Why They’re Cool, and How To Use Them” written by Chris Coyier. 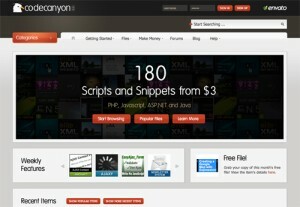 The fabulous team of Envato has launched yet another awesome marketplace, Code Canyon – The Code Marketplace. Yup, all the goodness of boosting up a website or blog – it’s all in the code baby 🙂 scripts bring the website to life!